Terry-Ann Craigie, assistant professor of economics at Connecticut College, explores whether taking the criminal conviction question off job applications can help ex-offenders get back on their feet sooner. Her latest project uses quasi-experimental methods to measure the national impact of public sector Ban the Box policies on the public sector employment of convicted individuals and young low-skilled minority males. She has already published in journals such as Oxford Development Studies, Eastern Economic Journal, The Review of Black Political Economy, The Journal of Ethnicity in Criminal Justice and The Future of Children, as well as books such as Innovations in Child and Family Policy. Professor Craigie has been a visiting fellow at the Urban Institute, visiting scholar at the University of Michigan and the University of Wisconsin-Madison, and has presented her research at a plethora of national conferences and research seminars, including The White House. 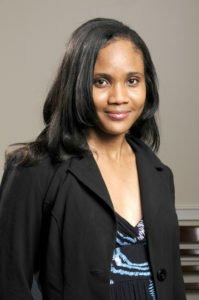 She is also a graduate of the American Economic Association Summer Training Program. Professor Craigie came to Connecticut College as the Lenore Tingle Howard ’42 Assistant Professor, Department of Economics, after completing postdoctoral research training at Princeton University. She previously taught at Michigan State University. At Connecticut College, she teaches Introductory Microeconomics, Economics of the Family, Economics of Discrimination and Advanced Econometrics. The rise in the U.S. correctional population since the mid-1970s has been nothing short of astounding. Incarceration rates have grown by more than 500% and an estimated 1 in 3 adults hold some form of criminal record. It is therefore no surprise that the clarion call for reforms to mitigate collateral consequences has become louder in recent years. The most visible and controversial of these reforms is “Ban-the-Box”. This reform promotes the deferment of conviction inquiries and criminal background checks until later in the hiring process, allowing job candidates to highlight their skills and qualifications first, before criminal history is revealed. As of April 2017, there are 26 states, DC, and over 150 municipalities that have adopted Ban the Box policies. But despite this prevalence, we know little about their effectiveness in improving the employment of the justice involved on a national scale. My national study finds that for ex-offenders aged 25 and older, Ban-the-Box policies increase the likelihood of public-sector employment by nearly 40% overall, and by up to 67% for states and municipalities that have fully implemented the policies. These results underscore that BTB policies are doing a great deal to improve the public-sector employment of the justice involved. Critics of Ban-the-Box suggest there are unintended consequences of the law, in that employers might engage in racial discrimination, hurting the very population the policies were implemented to help. This study however, finds no evidence of racial discrimination in the public sector context. While there is a long journey ahead to ensure equal hiring standards for all who have been through the criminal justice system, the evidence evokes true optimism about the social and economic possibilities for this population.